Place couscous in a bowl, pour over boiling water and stir briefly. Cover the bowl and set aside for 10 minutes for couscous to steam and soften. Meanwhile, prepare the herby feta: Place all the herbs in a bowl (set some herbs aside for garnish if you like) and add the olive oil. Cut the feta into medium sized chunks and roll in the herb mix and place on a clean plate. De-seed the pomegranate onto a separate plate. Make the dressing: Either whack all the ingredients in a small bowl and whisk it all together, or, combine everything in a clean jar with a lid and shake it all about (you might as well do the hokey tokey while you are at it). By now your couscous will be ready, so fluff it up with a fork, season to taste and set aside to cool completely. 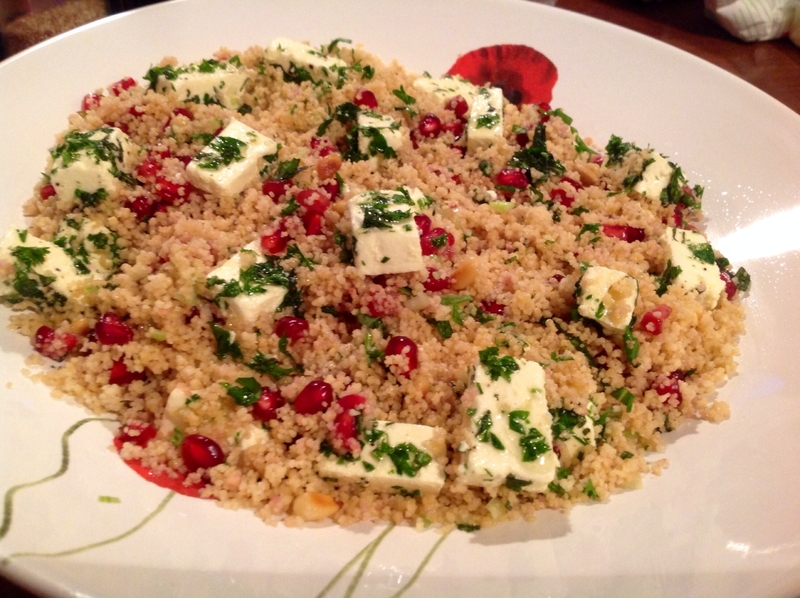 Add the herby feta, pinenuts, pomegranate and spring onions to the couscous. Add the dressing and gently fold everything together. Check seasoning again. *Apparently a bunch of clever ways you can de-seed a pomegranate. My method isn’t flash: I simply cut the bugger in half and scoop the seeds out onto a plate and pick any pith out before picking the seeds out to use. I do this over a plate in the first instance, rather than a plate, because you inevitably get bits of juice dribbling onto the plate. If you did this over the couscous, the juice would colour the couscous and it’s a tad unsightly. I’m just a bit fussy, clearly.